Today I'm sharing a gift ensemble made with beautiful Graciellie Designs Digital Stamps. 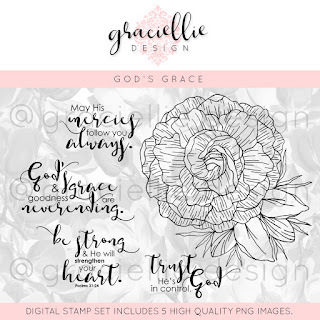 This card features her newly released "God's Grace" set. I printed the large flower on designer paper and added some black embossing powder as soon as it came out of the printer. The highlights were added with markers and paint before fussy cutting. I then stenciled a background on my pink tag using distress inks and added half of a paper doily to one side. Some tiny butterflies, pearls, and a big crinkle ribbon bow complete the front. I decorated a clothespin to match the flower and added one more butterfly to the bottom of the clip. The reverse side features a smaller version of the front flower (printed on watercolor paper, embossed with black embossing powder, and colored with watercolor paints), and a paper lace border. This was the perfect packaging for giving a gift card to a nurse friend of mine who recently retired! 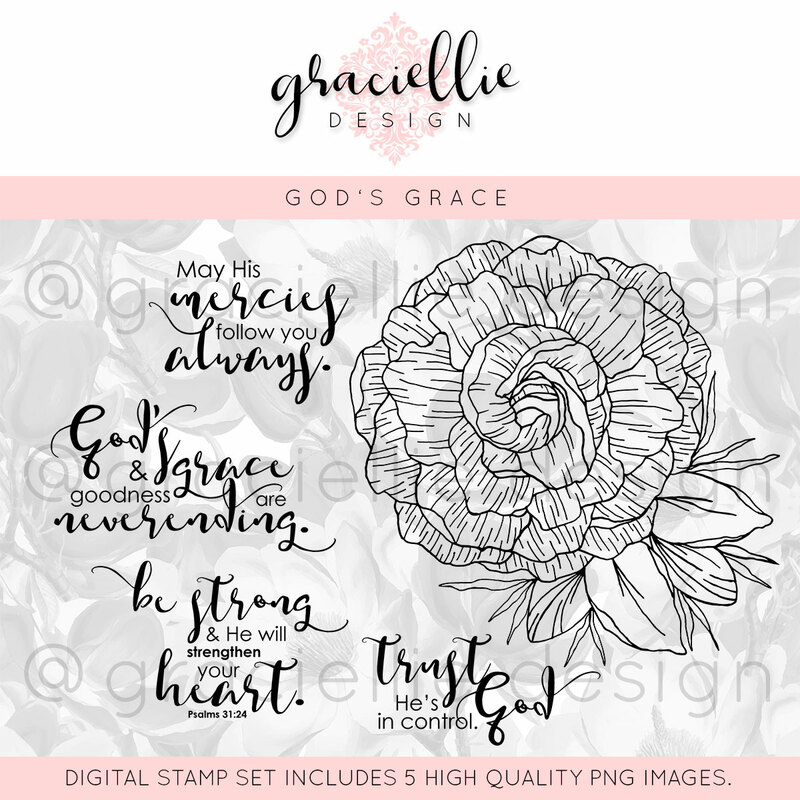 If you haven't already, you'll want to stop by Gracie's Etsy shop - Graciellie Designs - and check out all the lovely stamps, papers, and cut files she has for sale there! A pretty card for our 'I Spy' theme at Allsorts and great paper piecing, it's lovely to have you join in, thank you so much. This is truly stunning! I am inspired! Thanks so much for sharing. So beautiful and I love the colours. That is a very pretty flower and looks great printed onto the design paper. I like those butterfly pegs too. Thankyou for coming and spinning the butterfly wheel with me this week with 4 of the elements. Hugs Mrs A. So nicely done with wonderful details, many thanks for playing along this week at Allsorts challenge! Lovely stenciled background with the pretty patterned paper, such pretty butterflies and pearl accents. Oh stunning - what a pretty gift ensemble - all the details - and such eye candy - great job. What an amazing ensemble with all of the beautiful colors, flowers, and butterflies! Well done! What a beautiful paper bag. LOVE the flower and the sentiment a lot. The Butterflies and bow add extra sweetness to it. Gorgeous design, love the beautiful colors of your stenciled images and the lovely details on this tags. Thank you for sharing with us at SHOPPING OUR STASH, hope you play again soon. Ooh, such a springtime palette, and the added doily is the perfect touch! Thanks for joining in this week at Shopping Our Stash! Esther, this is a beautifully designed! All your layers and details are gorgeous!